Codename: Kids Next Door, commonly abbreviated to Kids Next Door or KND, is an American animated television series created by Tom Warburton for Cartoon Network, and the 13th of the network's Cartoon Cartoons. The series centers on the adventures of five children who operate from a high-tech tree house, fighting against adult villains with advanced 2×4 technology. Using their codenames (Numbuh 1, Numbuh 2, Numbuh 3, Numbuh 4, and Numbuh 5), they are Sector V, part of a global organization called the Kids Next Door. The series came about as the result of a viewer's poll by Cartoon Network. It ran from 2002 to 2008, with six seasons and 78 episodes. It also had two television films, Operation: Z.E.R.O. aired in 2006, and the series finale Operation: I.N.T.E.R.V.I.E.W.S., aired in 2008. The show revolves around the main home operatives of Sector V — Numbuh One (Nigel Uno), Numbuh Two (Hoagie P. Gilligan, Jr.), Numbuh Three (Kuki Sanban), Numbuh Four (Wallabee Beatles), and Numbuh Five (Abigail Lincoln). Their mission is to fight crimes against kids (such as homework and flossing) committed by adults, senior citizens, teenagers, and other "evil" children. They make up what is known as Sector V of a worldwide organization called the Kids Next Door. Warburton created a pilot episode, entitled "Diseasy Does It", for another planned show, Kenny and the Chimp, which was produced by Hanna-Barbera. Originally, there was a group of children who called themselves "The Kids Next Door" among the recurring characters, and would often get Kenny into trouble. The plot-line was then changed to focus on the group of kids alone, and later, the kids battling adulthood. In 2001, the show's pilot episode, "No P in the OOL", won a Cartoon Network viewer's poll, and as a result, Codename: Kids Next Door was greenlit to become a series, while Kenny and the Chimp was not greenlit by the channel. As an interest fact, the character Professor XXXL, that appeared in "Diseasy Does It", became a villain in Codename: Kids Next Door after Kenny and the Chimp wasn't picked up for a series. The episodes are titled as the Kids Next Door's missions, denoted as "Operation:" followed by an acronym which often gives viewers clues as to what the episode is about. The episodes have little continuity, although occasionally missions make a reference to earlier episodes or lead to consequences in another. Season Five's "Operation: O.U.T.B.R.E.A.K." is the only episode that is a direct continuation of another episode ("Operation: V.I.R.U.S."). Stories in the earlier episodes were often about typical childhood problems, but magnified and exaggerated. As the series progressed, a more complex and continuous storyline developed. The final season revolved around a mysterious splinter cell within the KND itself observing Numbuh One for an unknown assignment. This was concluded in the series finale Operation: I.N.T.E.R.V.I.E.W.S. The show frequently contains references to films, especially in the later seasons, such as Dragon Ball Z, The Pink Panther, Planet of the Apes, Jaws, Jurassic Park, King Kong, The Terminator, Resident Evil, Star Wars, Lord of the Rings, The Matrix, X-Men, James Bond, Toy Story, the Stargate franchise, Pirates of the Caribbean, and the Indiana Jones film series. The Kids Next Door Organization is a worldwide group comprising thousands of kids joined in mutual struggle against teenage/adult tyranny. They fight villains that embody specific menaces to children overall (such as dental hygiene or school lunch). Following a period of training, every member of the Kids Next Door chooses a number or alphanumeric code (deliberately pronounced and spelled as "numbuh") and is sent to a "sector" that acts as their home base. Sector headquarters are often tree houses of ludicrous proportions, which often suited to their environment. This includes a base constructed beneath the Arctic ice shelf, and a base built into a large pine tree. The main headquarters of the Kids Next Door is a tree house Moon Base. Kids follow their oath of protecting other kids as well as battling adulthood until the age of 13, when they are "decommissioned", a process of wiping their memories of any past KND activity and warping their minds. Such a practice has inevitably led to the creation of many KND villains who escaped decommissioning (notably Cree, formerly known as Numbuh 11 and Numbuh 5's older sister, and Chad, formerly known as Numbuh 274 and supreme commander of the Kids Next Door). The practice of strict decommissioning at age 13 was later on revealed to be subject to exceptions: kids who have proved to be exceptional agents are offered the chance to carry on in KND as spies infiltrating the teen organization. Decommissioning has also proved reversible due to a "re-commissioning" module used twice in the series. KND agents utilize a vast array of mechanical, electronic gadgets and machinery, collectively referred to as 2x4 (two-by-four) technology. The KND 2x4 technology was originally conceived as an assortment of common household objects, being put to use in combat situation; a theme that their weapons continued to adhere to. However, as the series progressed, the complexity of their defensive weaponry and transportation advanced to such absurd levels as to be considered science fiction, despite all of it still being constructed with nothing but household materials. In addition to the technology, many KND operatives also wear helmets similar to kabuto or samurai helmets — an example being Supreme Leader Numbuh 362. A common theme of the show is the introduction of a new never-before-seen device, complete with its own acronym, in a sidebar screen that temporarily interrupts the storyline. It is interesting to note that many of these devices require military-level driving or piloting skills in order for them to be operated effectively. There are six seasons, each with 13 episodes (two half-length episodes counting as one), adding up to 78 episodes altogether. There have been two TV movies, the first taking place between the second and third episodes of season 6 (Operation: Z.E.R.O. ), and the second at the end of season 6 (Operation: I.N.T.E.R.V.I.E.W.S. ), which served as the series finale. In 2005, The series won The Best Television Series for Children Award at The Ottawa International Animation Festival for "Operation: A.R.C.H.I.V.E. ", which was written by Tom Warburton & Mo Willems and storyboarded by Guy Moore and Quack Leard. The following year, "Operation: L.I.C.O.R.I.C.E." won the Festival's Collideascope Award for Television Animation for Children. Two DVDs in two volumes were released of Codename: Kids Next Door, totaling 16 episodes. Sooper Hugest Missions: File One 9 October 26, 2004 May 15, 2006 February 13, 2008 Includes the episodes "Operation: I.-S.C.R.E.A.M. ", "Operation: P.I.R.A.T.E. ", "Operation: L.I.C.E. ", "Operation: L.I.Z.Z.I.E. ", "Operation: T.H.E.-F.L.Y. ", "Operation: C.A.T.S. ", "Operation: S.P.A.N.K. ", "Operation: S.U.P.P.O.R.T. ", and "Operation: G.R.O.W.-U.P." as well as a bonus Foster's Home for Imaginary Friends cartoon, 2x4 technology profiles, and game tips for Operation: S.O.D.A. Sooper Hugest Missions: File Two 7 August 23, 2005 N/A N/A Includes the episodes "Operation: C.A.N.N.O.N. ", "Operation: C.A.M.P. ", "Operation: C.H.A.D. ", "Operation: S.H.A.V.E. ", "Operation: T.R.I.P. ", "Operation: T.R.A.I.N.I.N.G. ", and "Operation: D.A.T.E." as well as a bonus The Grim Adventures of Billy & Mandy episode and game tips for Operation: V.I.D.E.O.G.A.M.E..
Scooby-Doo and the Toon Tour of Mysteries—"Operation: T.E.E.T.H. ", "Operation: P.O.I.N.T. ", "Operation: I-S.C.R.E.A.M." Cartoon Network Halloween 2—"Operation: T.R.I.C.K.Y." Cartoon Network Christmas 2—"Operation: P.I.A.N.O." Cartoon Network Halloween 3—"Operation: J.E.W.E.L.S." Cartoon Network Christmas 3—"Operation: N.A.U.G.H.T.Y." Toon Foolery — Laugh Your 'Ed Off!—"Operation: C.A.K.E.D"
On an episode of The Grim Adventures of Billy & Mandy entitled "Sickly Sweet", a scene depicts Grim watching Codename: Kids Next Door. Also, in Billy & Mandy's Big Boogey Adventure, Numbuh Three makes a cameo as Grim's replacement. Also, in the MAD episode "Taking Nemo / Once Upon a Toon", Numbuh One cameos as one of the cartoon characters who has forgotten his identity. The show was also referenced in the New Boyz song "Tough Kids." In the 2004 film Sideways, the show is playing on Miles's mother's television set. Stories featuring the Kids Next Door have been featured in the comic series Cartoon Cartoons, Cartoon Network Block Party, and Cartoon Network Action Pack. The characters are also featured in the books 2x4 Technology Handbook and Sooper Secrets and Boomerang Bloopers, both by Alison Wilgus. A trading card game based on the series was launched by Wizards of the Coast in July 2005. Two video games were released for the series: Operation: S.O.D.A. in 2004 for the Game Boy Advance and Operation: V.I.D.E.O.G.A.M.E. in 2005 for PlayStation 2, Xbox, and GameCube. Several browser games were also released on the Cartoon Network website. The MMORPG style game Operation: B.E.S.T. was playable for a brief time in 2005, but was shut down shortly thereafter. In Cartoon Network Universe: FusionFall, Numbuhs One through Five, and villains Father, Toiletnator, and Stickybeard appear as non-playable characters. KNDefense armor and 2x4 Tech weapons are available for players, Sector V's treehouse can be explored, and KND S.C.A.M.P.E.R.s can be used for transport. In Cartoon Network: Punch Time Explosion, Father and Numbuh 1 are playable, Sector V Treehouse and the C.O.O.L.-B.U.S. are arenas, and Numbuh 2 and Stickybeard are assist characters. In the console versions, Toiletnator is a playable character, Numbuh 4 is an assist character, and KND Moonbase is an arena. On March 19, 2015, a video was posted on YouTube of what appears to be an animatic of a new series featuring Numbuh 1 and the Galactic KND, entitled Galactic: Kids Next Door. It was later revealed to be an attempt to try to get the series approved with help from fans. On April 1, 2015, a petition was started on Change.org to make G:KND a real spin-off series. Many fans signed the petition, including creator Tom Warburton and Numbuh 4's voice actor Dee Bradley Baker. The next day, a fan-made Facebook page was created to advertise that a G:KND series was still possible. On June 1, 2015, Warburton revealed that the idea of a G:KND spin-off started since the end of the original series along a Cartoon Network executive, but any came in fruition, so he wrote a script. 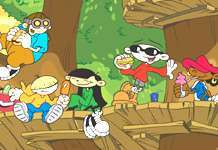 Eighteen days later, Warburton revealed that Cartoon Network had rejected the G:KND spin-off and doesn't have plans for continue the Codename: Kids Next Door franchise, but he is confident to get the spin-off approved in the future. In April 2016, Warburton stated that Cartoon Network finally doesn't greenlight the G:KND spin-off, but he also said that the petition could serve to convince them in the future. In September 2016, the original video released by Warburton was re-animated by Rat Animation, retaining the original voice acting but given a full animation style, versus a stop-motion and black and white animation style used in the original video. Also, Rat Animation has shown its support saying Warburton that if the first episode of the spin-off is written, they would animate it. ↑ "Codename: Kids Next Door". Metacritic. ↑ "'Total Immersion Cartoon' Events Take Control at Cartoon Network". Time Warner. February 21, 2001. Retrieved 2016-09-22. ↑ "Codename: Kids Next Door - Operation Z.E.R.O. - IMDb". imdb.com. ↑ "Audio Interview: Tom Warburton". Frederatorblogs.com. November 9, 2006. Retrieved 2008-10-24. ↑ Ball, Ryan (December 5, 2002). "Codename: Kids Next Door Goes Into Action". Animationmagazine.net. Retrieved 2008-10-27. ↑ "Operation: M.A.U.R.I.C.E.". Codename: Kids Next Door. Season 4. Episode 11. 2005-07-08. ↑ "Kids Next Door Movie Debuts Friday". Animation Magazine. August 7, 2006. Retrieved 2008-10-27. ↑ Bynum, Aaron H. (August 8, 2006). "Begin Operation Z.E.R.O.". Animation Insider. Retrieved 2008-10-27. ↑ "Codename: Kids Next Door". commonsensemedia.org. ↑ "2005 Ottawa International Animation Festival Awards". animationfestival.com. Retrieved 2016-09-22. ↑ "Codename: Kids Next Door: Sooper Hugest Missions File 1". Madman Entertainment. Retrieved 2013-05-25. ↑ "Codename: Kids Next Door - File 2". TVShowsOnDVD.com. Retrieved 2013-05-25. ↑ "New Boyz - Tough Kids Lyrics".